There are 1978 high rise towers (both condos and office towers) in the City of Toronto with a height above 35 meters. Currently there are 145 buildings under construction - almost all of them are condos. Additionally there are 233 proposed high rises (mostly condos). 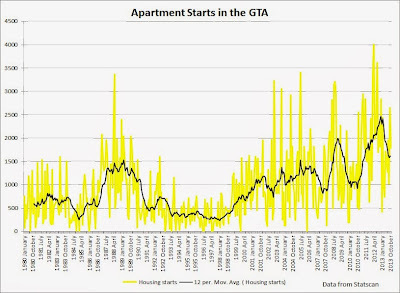 Overall there were 55,453 apartments under construction this past November (most recent stat available) in the Greater Toronto Area. 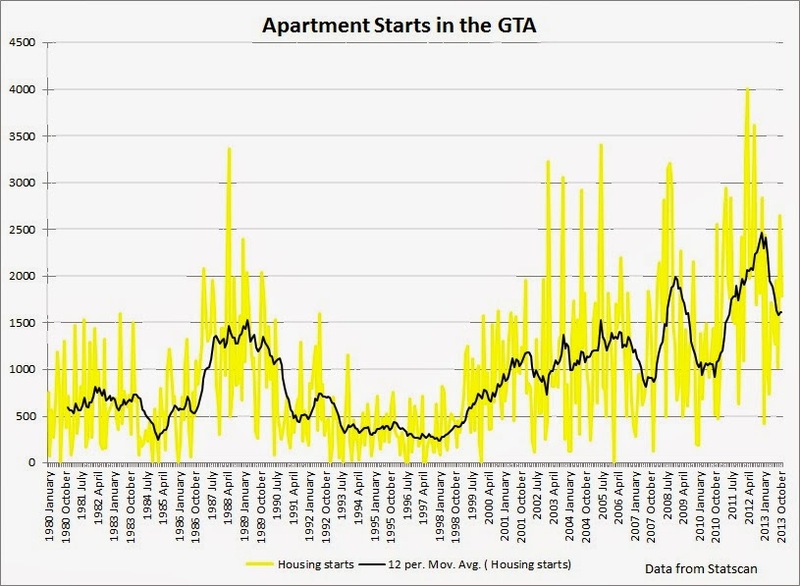 Almost all of the apartments under construction were in the City of Toronto. Half of the units were located in the downtown core. New condo sales in the City of Toronto declined by 3.5% this past November. Sales were down by 56% compared to November 2011! 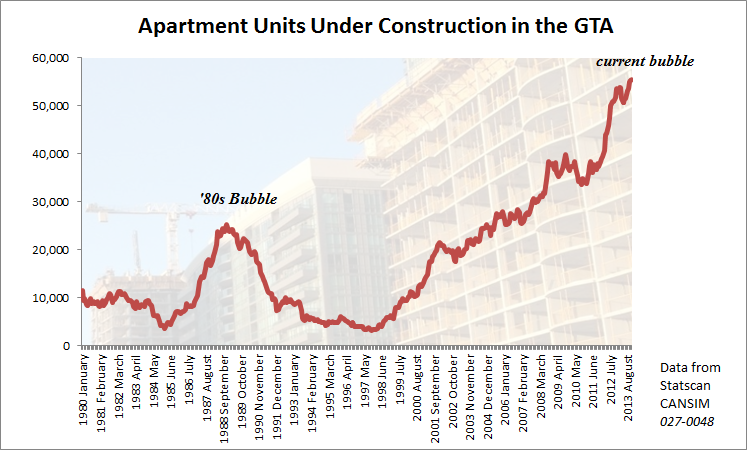 Yes 2011 was a record year for condo sales - the peak of condo horniness! 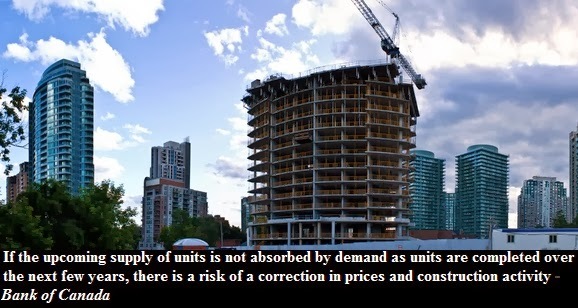 Overall, November new condo sales in the GTA were running 18% below the 10 year average. All in all, new condo sales are no longer in a free fall yet investors are not jumping back on the market as resale condos increased in price by 7% in mid-December. The new condo price index declined by 0.4% in November 2013 compared to a year earlier. 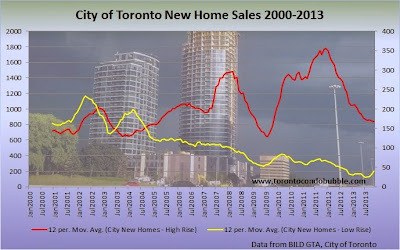 The new high rise index stood at $435,620 this past November. As sales tumbled, so did the condo starts. 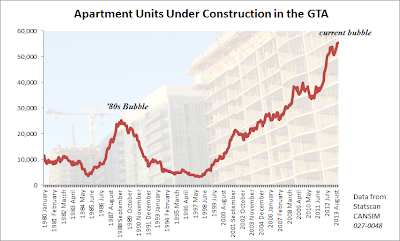 Expect apartment starts to further decline. Former Goldman Banker to Head CMHC: "Canada's Mortgage Monster"